I have a 35/1.4 AI which is now almost completely stuck and almost impossible to focus. I'm tempted to clean it myself. I have not found anything relevant on internet, except a video opening it but not touching the helicoids. I also have, of course, read Richard's advices. Has any of you already cleaned and regreased the helicoids on that lens? Any specific advice? which 35/1.4 is it? this one? OMG, this has a CRC element!? I cleaned a 24/2.8 AI between the aperture blades because they must have been coated excessively and they shed so much photos were foggy looking. I don't remember it being difficult. I ascribed a thin line with a sharp needle for realignment. The complete read group was the CRC. The 35/1.4 might be a milk run. Nope, all the 35/1.4 versions have CRC (as do all 28/2 and 24/2.8 lenses). When it was introduced in 1970 it was a very advanced lens, with a modern optical design, floating elements and fully multicoated. You might be thinking of the 28/2.8, which gained CRC with the AIS version. I've got the same lens and opened it up to clean some dust from between some of the rear groups. that wasn't a big deal, but I was worried so looked for a manual. I never purchased one, but recently got a note from ebay about a manual still being up for sale. might be worth it. just checked...still there. 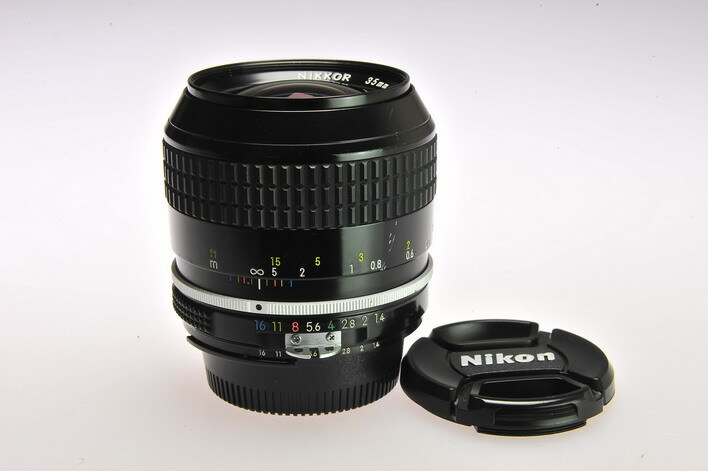 search for "Nikon Nikkor 35mm F1.4 Ai Lens Service & Repair Manual"
I initially though I would take Richard's offer but I haven't (yet) found the way to ship the lens to Japan without having customs duties applied both way. If I can't find a way, I'll try it myself, I guess. Brent, I purchased the manual. Thanks for the info. I want to see the manual! I've opened mine but not got to the helicoids. I just had to clean some dust from around the aperture blades. it took some effort to drip enough acetone in the tiny hole to loosen up the front ring (drip it in over a few hours every 20 minutes). If I remember correctly you access the drip hole after you slide the grip off. It was pretty straightforward getting things apart and I'm sure Richard has done a similar lens that you can use as a guide (Thanks for all those, Richard!). I'm not an expert or anything, but if you don't have to take the CRC elements apart to clean them, don't! **** didn't realize I posted the same above....sorry for the duplicate! bad memory! The CRC can confuse people who aren't used to things like this. getting the orientation wrong can lead to a wrong result. I spent many many hours on my CRC 105/2.8 Ai-S because I took my notes with the lens in the wrong orientation!